Are you looking for Cantonment Public School and College Job Circular 2019? Welcome to another Latest & popular Job Circular. This time, Nirjhor Cantonment Public School & College Job Circular is available here. Today, We are describing the Cantonment Public School and College Job Circular 2019 which published on 17 March 2019. The Application Submission is ongoing and it will be closed on 31 March 2019. So, the Eligible Applicants need to submit their Application within the validity period. 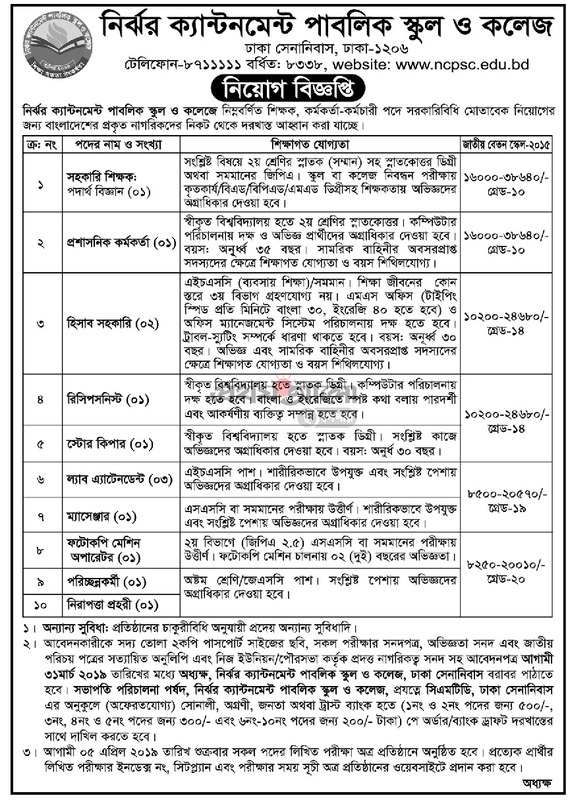 Total 13 Job Vacancies are available under Cantonment Public School and College Job Circular 2019. It is a Government Job Circular in March 2019. The Salary will be distributed as per National Pay Scale 2015 and post wise Salary Information; Grade is available on the Circular. If you are eligible and want to Apply for any post of this Job Circular, You need to read the below PDF Circular. We have added the Official Circular here from Prothom Alo. Nirjhor Cantonment Public School & College Job Application Form, Application Deadline, Salary, and all other Information is available on the below. So, stay with us and read the details information from the below. If you want to know more information, you can contact the Authority. In the Circular of Nirjhor Cantonment Public School & College Job Circular, You will see their Office Address and Contact Phone Number. So, get Proper Information from their end.